Here's one of my very favourite book formats: the Coptic stitch. I just love how the exposed stitching shows on the spine. Rose signature wraps on alternate signatures. The paper throughout is vintage (1970s) Abbey Mills in Slate, a lovely dove grey, really ususual, and a perfect 115gsm weight. Perfect for writing or drawing, strong enough for collage. Displaying the whole book - A5 size. I used an Anna Griffin scrapbooking paper for the covers and signature wraps. On the cover, I've collaged a vintage photograph, a wine label and cut out a flower (Tim Holtz's 'Tattered Florals' die) which I curled over my fingers to shape the petals. I added dimension and supported the petals with silicone glue. I've also added photo corners, Broderie Anglais lace and die cut borders. And finished off with a couple of vintage buttons. This shows the signature wraps - I used two layers of the rose paper, back-to-back, so they can be left as is, or a pocket or envelope added in between the layers. Hope you like this! And if you want to have a try yourself, I have a tutorial (with photos and my own hand-drawn illustrations) in my Etsy shop. I've also listed the journal. 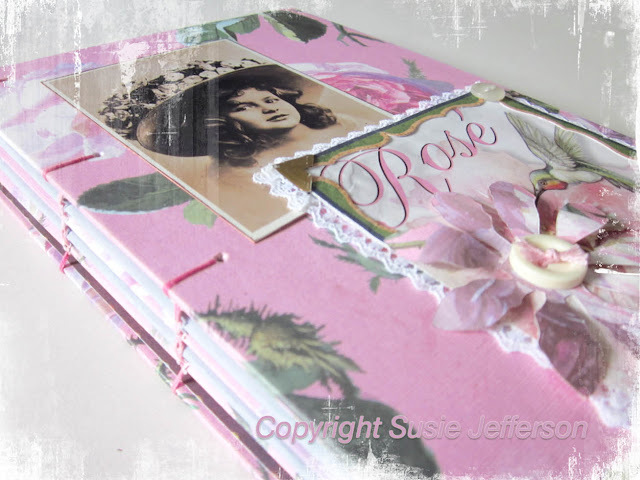 Hi Susie, Your pink rose Journal is just lovely. Love all the pinks! I really like your photos. Happy Pink Saturday. I will leave the journal making to you.I never got into that. Yours are lovely. Simply gorgeous, every element is so pretty. Such creative and beautiful work. Hi Susie, thank you for stopping by the shop. I was so busy in July but your page definitely left a lasting impression for me the first time I visited. By the way, I absolutely LOVE music so I could not resist visiting your music page. Let it play! let it play! let is play!! 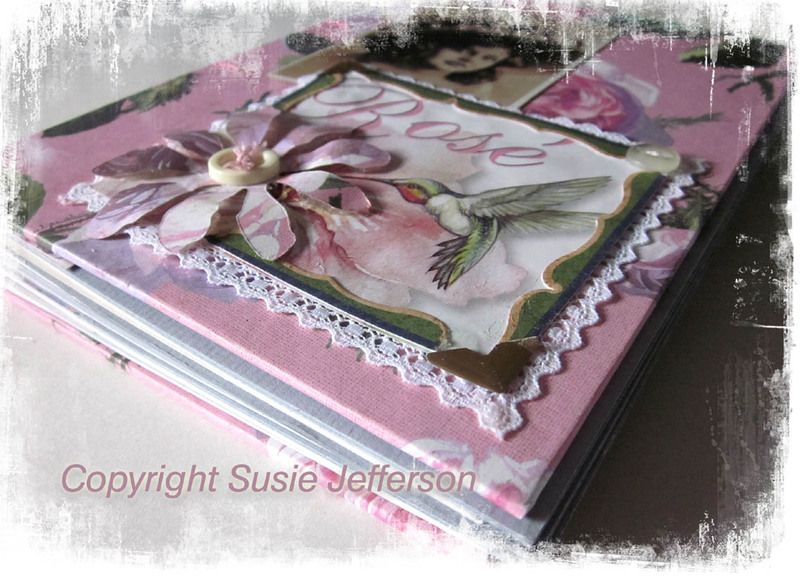 Susie...I love all your beautiful details in this journal. Bravo. Gorgeous! 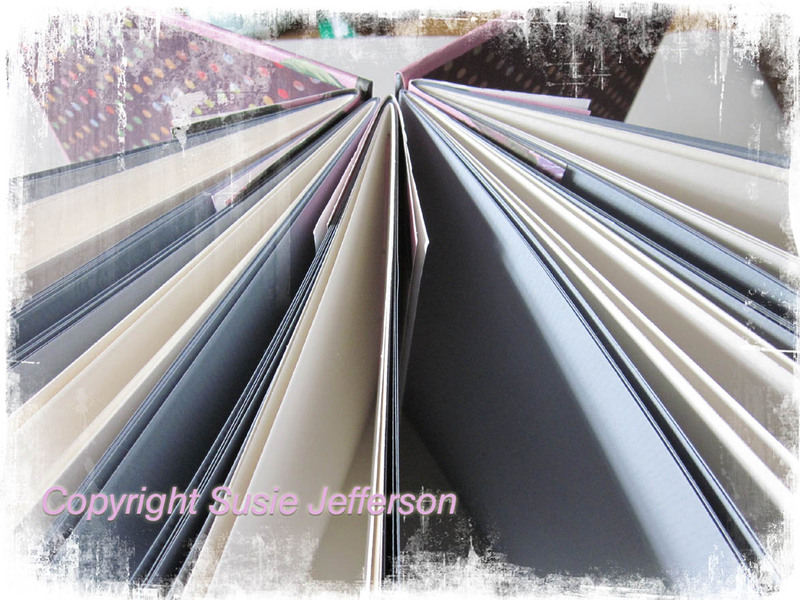 I haven't tried any book binding but it is on my list. Thanks for some awesome inspiration. I found your book at Pink Saturdays. Here I am watching the Olimpic games and I receive a wonderful comment from a sweet lady from the UK..what a lucky Pink Sat.! Very happy for the two US teams, Serena Williams in tennis and Basket Ball!! Your journal is totally lovely, I love the pink roses and the sweet vintage face, it cannot get any more perfect for Beverly's Pink Sat.! I am going to visit your music blog..I adore music, it always makes me happy and sometimes sad too, a mix of emotions, lol.. Happy weekend. I have not been by your blog in "forever". Nice to see you again. And, thank you for stopping by my blog and leaving me a comment. I love your journal/scrapbook. This is the second time I've heard of Tim Holtz. Robyn (Beverly's Link #28) of Scrapbooks & Journals mentioned him in her post for Pink Saturday. She's going to a stamping convention this weekend there in Ohio (? I think?. She will be posting about it too. Thought I'd mention it to you in case you haven't seen her post for Pink Saturday. Anyway - looks like Holtz's stamps are pretty cool. I had to ask Robyn what ATC was and now, I'll have to find out what "Rose signature wraps on alternate signatures" and "signature wraps" are. I think I figured out "Coptic Stitching" from your photos. That is neat. I see you have some "freebies" on a page - I just might see what's there. I've missed stopping by cuz you have often very neat things. Happy Pink Saturday from the very hot Central Texas USA ... :) Thanks! Hi Susie, Your journal is gorgeous. The cover is so pretty and I love the vintage part of your design. The stitching is very clever. I can see you really know what you are doing. I am such a beginner but I am loving the challenge. 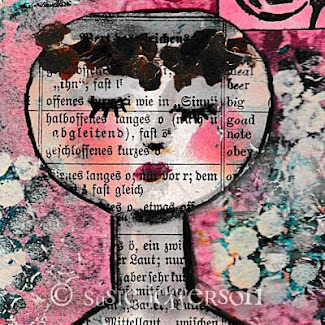 Happy Pink Saturday, Susie. 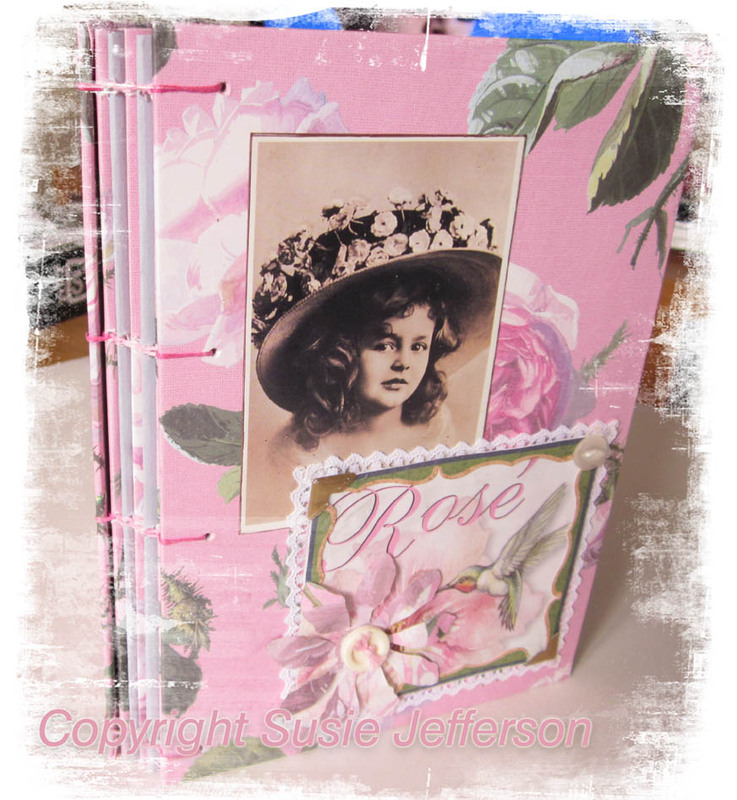 Your rose journal is so pretty, another wonderful creation! Thanks for your visit and enjoy your weekend. This journal is fabulous! 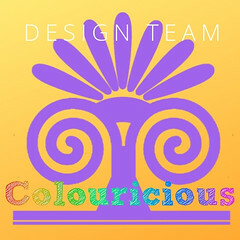 Love the colours! Sooooo beautiful and elegant! A really lovely book! Bless you Dot, you always say the nicest things!